Whether the requirement is for a single-screen cinema, small theatre or giant multi-plex, our cinema digital signage solutions can be tailored to suit. Since 2004, our team at Signbox Microsystems has been working with the biggest names in the cinema industry to ensure audiences don’t have to be in their seats before being captivated by what’s on screen. Flashing images and colourful lights attract people’s attention more so than static notice boards ever could. Displaying pertinent information with holds that attention. 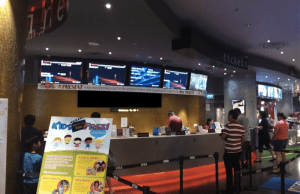 Our cinema digital signage systems can be used to keep the public informed of show times, ticket costs, weather forecasts and special ticket offers. Previews of feature films and video clips of cartoons will attract children and keep them entertained right up until it’s time to take their seats. With our signCine module, cinemas particularly appreciate being able to create displays that constantly update information on what’s showing, ticket prices and availability and future performances by linking the cinema digital signage system directly to any of the popular venue management and ticketing systems like Vista, Veezi and Radiant. Whether the requirement is for a single-screen cinema, small theatre or giant multi-plex, our cinema digital signage solutions can be tailored to suit. Understanding the need to keep start-up costs to a minimum, our systems are designed to work in such a way that a single PC can deploy information to different screens across an entire signage network. Designated content can be sent to different screens, even in separate buildings, from one user interface.